If you are looking for luxury, comfort, style, professionalism, and success all in one Cabo fishing package, then look no further than the 19s Toy. This 35-foot Cabo fishing vessel is the top of its class. Complete with an air-conditioned cabin, an onboard restroom, fighting chair, twin 3208, 375HP Cat engines, and a microwave, the 19s Toy is the perfect Cabo charter for larger groups and anglers looking for as much comfort as they are adventure. The 19s Toy allows groups of up to 8 to enjoy a top of the line Cabo fishing charter. Here at our company, we do not take our fishing charters lightly. We provide only the best boats, with the best team of experienced Cabo fishing guides, and with the best fishing equipment possible. 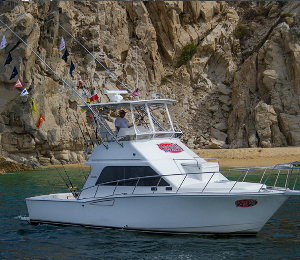 We pride ourselves on never cutting corners and offering our guests the best possible fishing trip in Cabo. Few, if any, other fishing charter fleets offer the type of professionalism, service, and dedication that we offer our guests. When you reserve the 19s Toy, you are getting much more than simply fishing. We provide you with the most professional English-language instruction, world class tackle, live bait when available, snacks for breakfast, turkey sandwich for lunch, bottled water, and an ice cooler for any additional beverages or snacks you might want to bring. Do not hesitate to book this very sought-after vessel. Fishing in Cabo is one of the most time-honored and popular activities in Cabo, so make sure to make reservations early! The standard is 10- 20% based on your satisfaction of the crew s performance. I have been to the Bahamas many times, but 19's Toy - 35' Cabo is one of my favorite trips! It includes everything that everyone should do here. As a Bahamas veteran, I can say only the best about this experience!